Walmart challenges and inspires me. 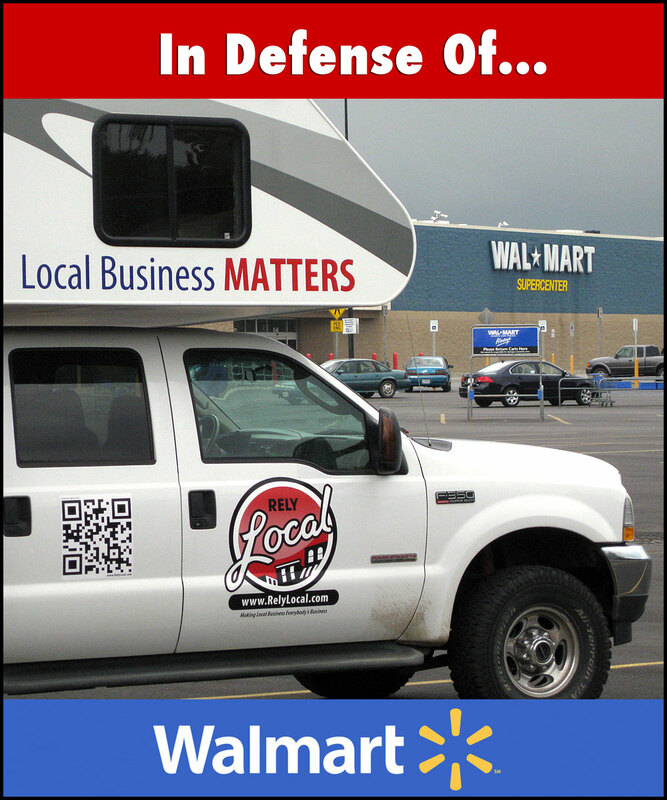 While it may seem incongruous for the outspoken leader in America’s growing “buy local” movement to speak out on Walmart’s behalf, there are some things that I have always thought that Walmart really does right. 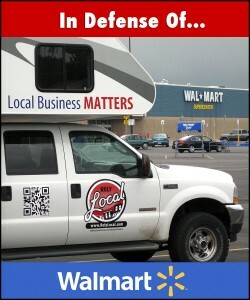 Actually, we have never been anti-Walmart or against big business, we’re just pro-small-business. Our mantra has always simply been – when you have the option to shop locally, do so! Shortly after Mike Jeffries (CEO of Abercrombie & Fitch) was getting raked over the coals for defending his stance that ugly people and fat people weren’t welcome to work (or even shop) in his stores, I found myself in two different Walmart stores in two different states. In short, I left them both… in tears. At the first store, I was looking for a bug-remover to help get rid of the billion-bug-blast that was covering the front of the RelyLocal Tour Rig after the last tour. I found a morbidly obese worker with a very distinctive birthmark covering half her face and asked for directions to the correct aisle. Rather than just pointing the direction, she dropped everything she was doing (in the completely unrelated Crafts department) and, with the help of her cane, she waddled her way to walk me the eight or ten aisles to point out the specific brand that she preferred for a myriad of reasons. On the way back out to the rig, I was struck by her willingness to help and her genuine concern for me as a fellow man. I was also struck, wondering if I were in retail, if I would have the character to hire a woman with stature, “flaws”, and disabilities to be a public “face” with my own customers. The fact that I even had to ask myself that question troubled me deeply. At the second store, I was looking for an obscure battery to power a microphone for an interview we were doing. I found myself looking in the face of a man in his late 40‘s who had lost part of his face to an accident of some sort that had also resulted in a voice and speech pattern that was fairly difficult for me to understand. I was immediately uncomfortable. This discomfort was due to my subconscious fears and prejudices, not because of anything that the friendly clerk had said or done. Of course, my awkwardness was laid to rest within a millisecond when the man proudly exclaimed that he knew exactly which battery I was looking for, as it was the same one he used in sort of fishing device he had. Before I knew it, I had the battery I needed and received a really helpful lesson on how to catch salmon in the area – something I earnestly wanted to know more about. Our conversation was gently interrupted by an very young co-worker politely asking my helper for help on an issue, when it became abundantly clear that the young man had a profound respect for his disfigured boss. I made it out the door, but lost the fight of choking back tears on my way to the car. This type of leadership isn’t formed in a vacuum. A different corporate culture could just as easily fill positions with teenage beauty queens or jocks (just ask managers of Abercrombie & Fitch). These Walmart managers didn’t hire obese geriatrics and disfigured managers by accident – it’s clearly a part of their DNA, and to that – I salute them. My Point? I guess I never expected to be inspired and challenged by Walmart to be a better person and a better leader… Job well done, Wally.